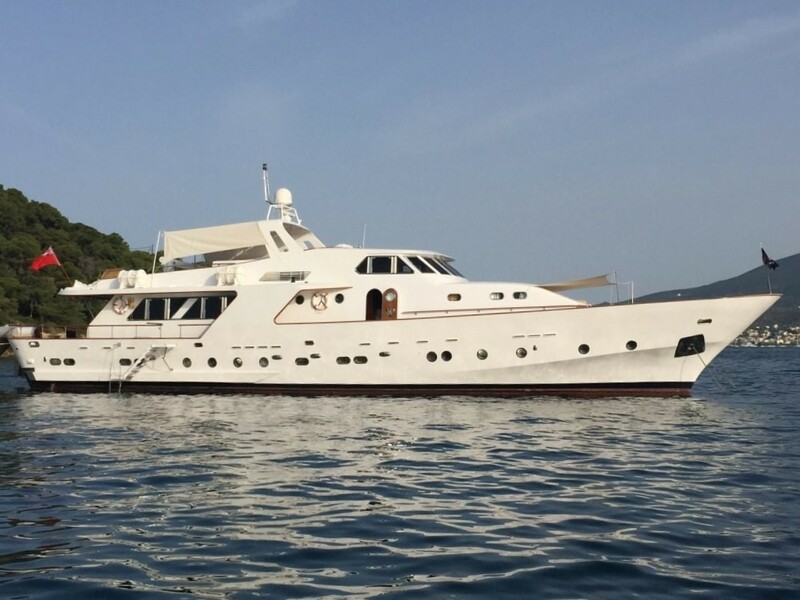 Classic motor yacht OCEANE II (Ex Elvis) was built in 1976 by CRN Ancona and refitted in 2014. 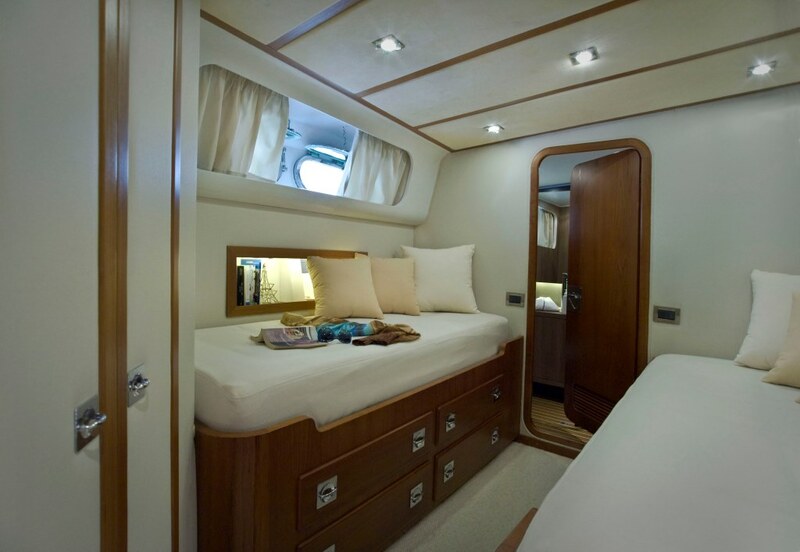 Measuring 28m (91.10ft), OCEANE II accommodates up to 9 charter guests in 4 en-suite cabins. 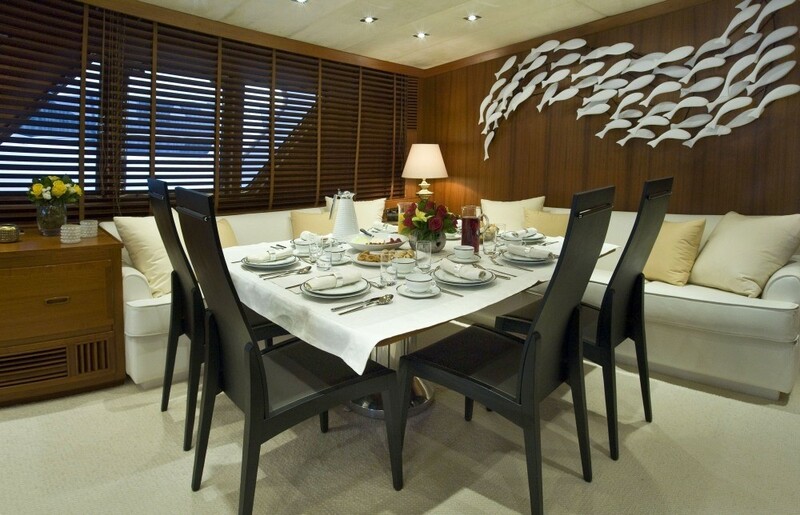 M/Y OCEANE II features a contemporary and elegant interior décor. 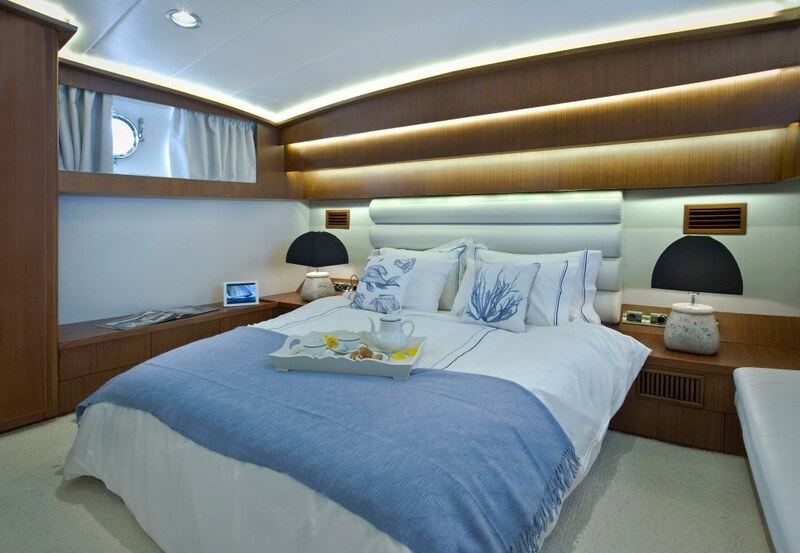 Crisp white soft furnishings, cream carpets, suede head liner and timeless matte finished wood panels, create fresh and calm ambiance. 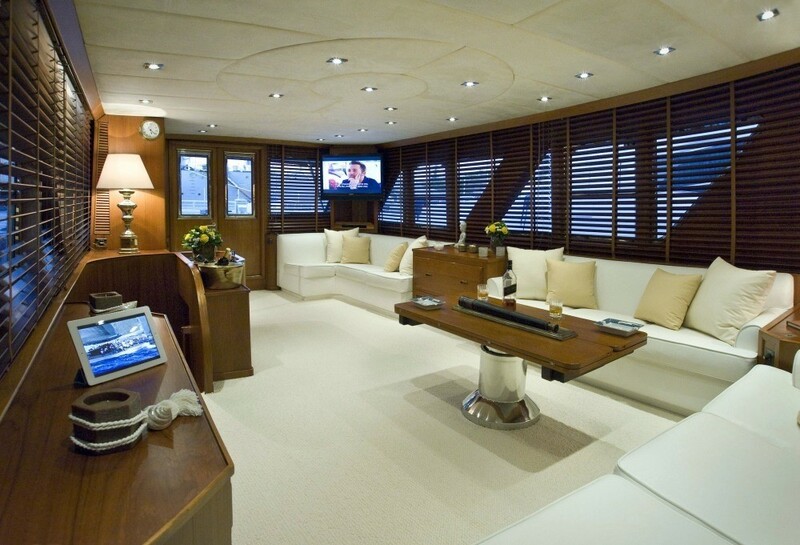 The salon offers 3 large sofas, a convertible table and full entertainment center, including SAT TV, DVD and music. 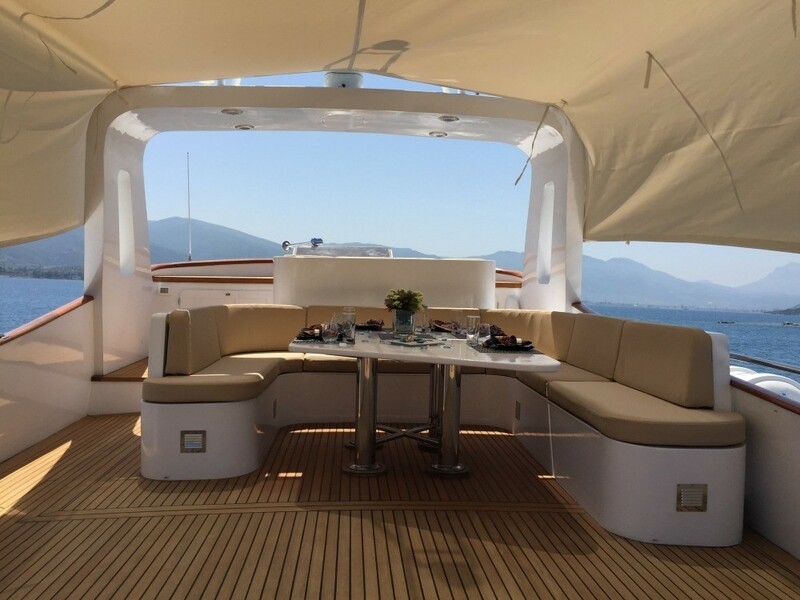 With panoramic windows surrounding the space, the salon receives ample natural light and provides endless views. 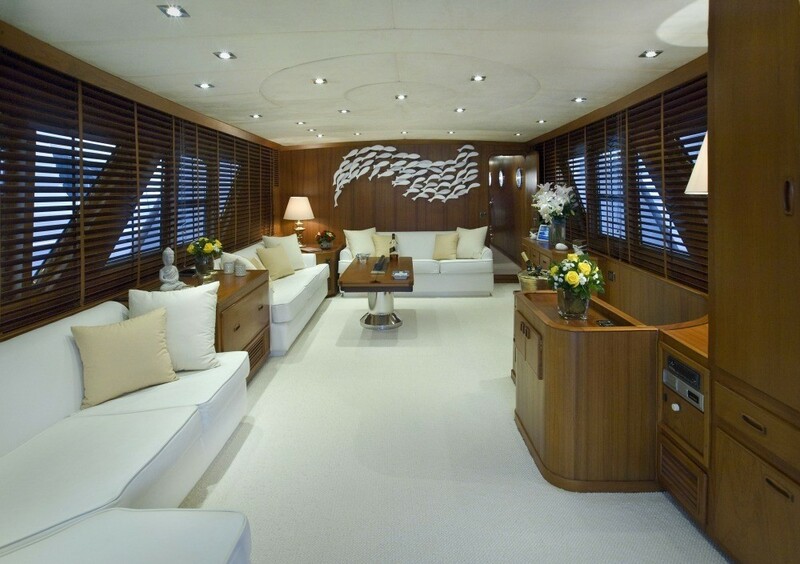 A foyer on the starboard side leads past a day head and to the full beam master cabin, with double bed and optional sofa bed. 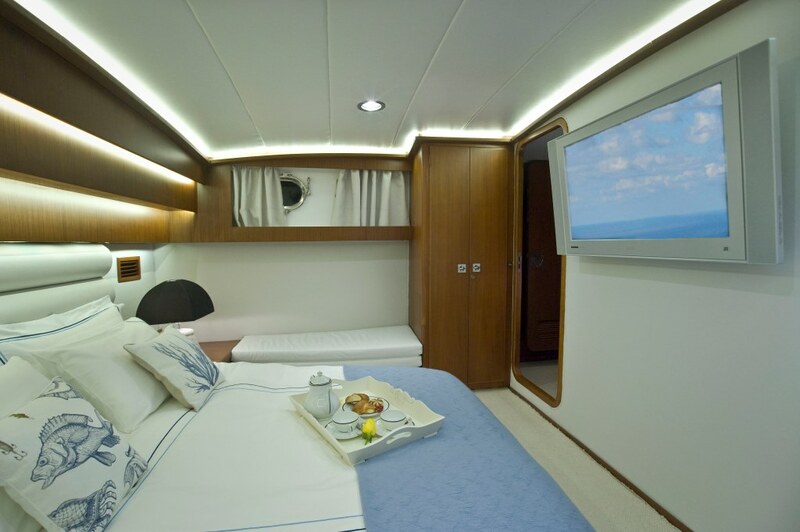 Further guest accommodation is below decks in the VIP cabin aft and 2 twin cabins amidships. 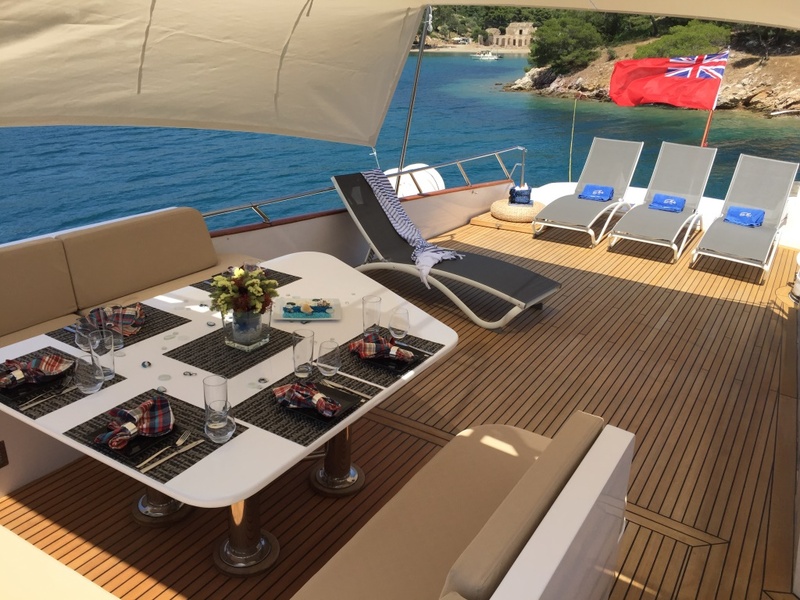 Crewed charter yacht OCEANE II has plenty of exterior living to enjoy in style. 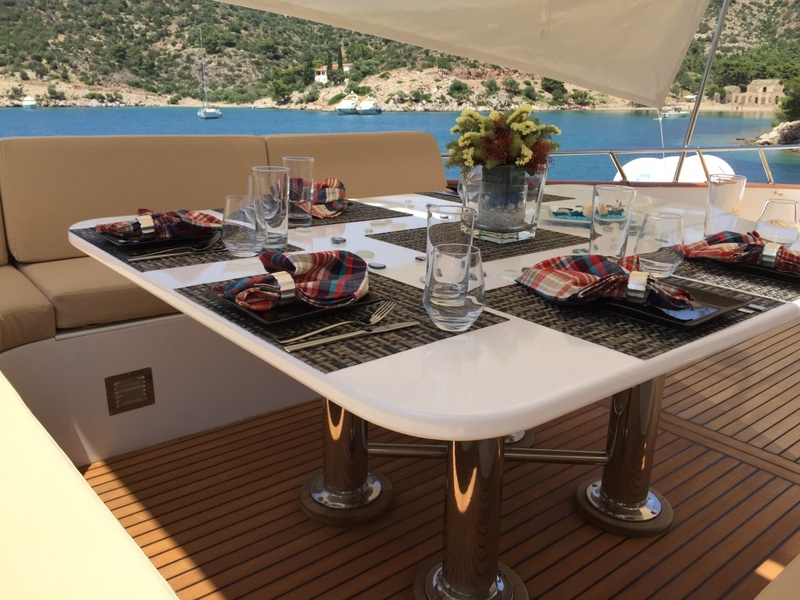 The aft deck is adjacent to the salon and offers shade and an alfresco dining option. 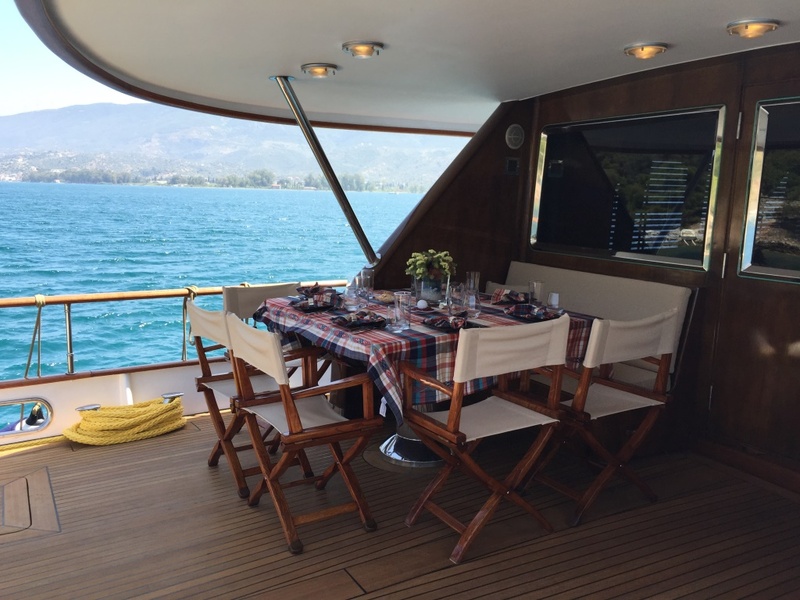 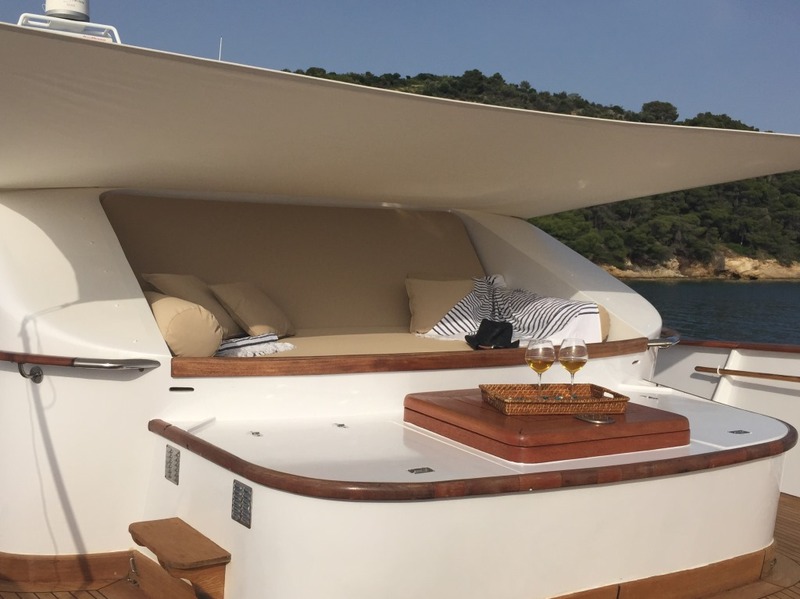 On the foredeck, an upholstered seating area and bow seat are great for a quiet moment. 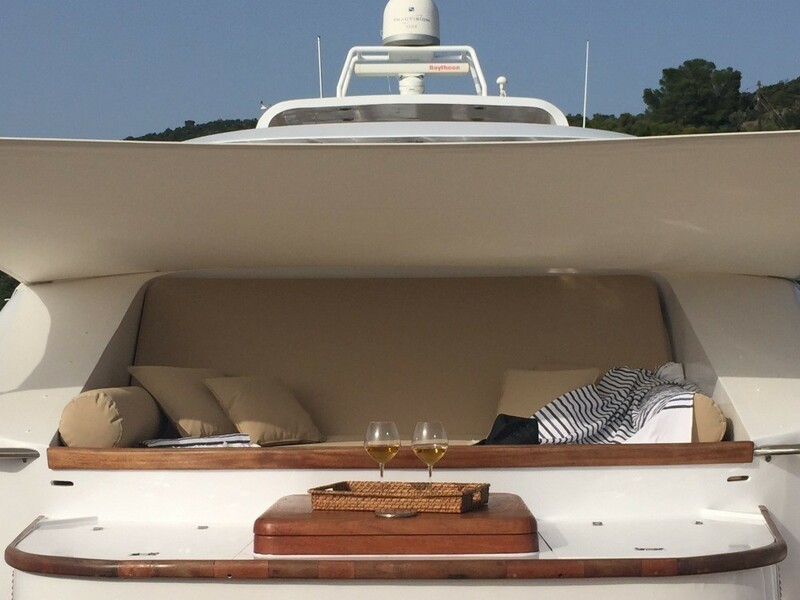 An upper flybridge is perfect for entertaining and relaxing, offering a large alfresco dining option and double sunpad. 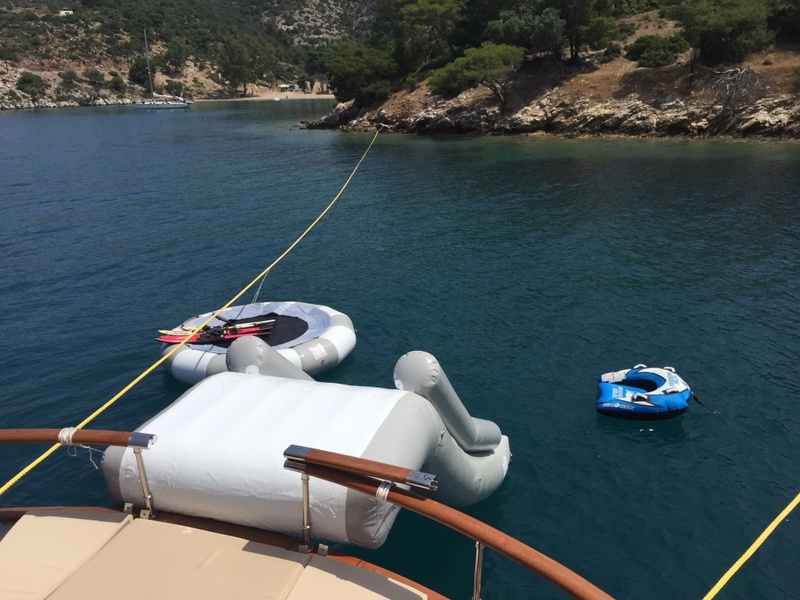 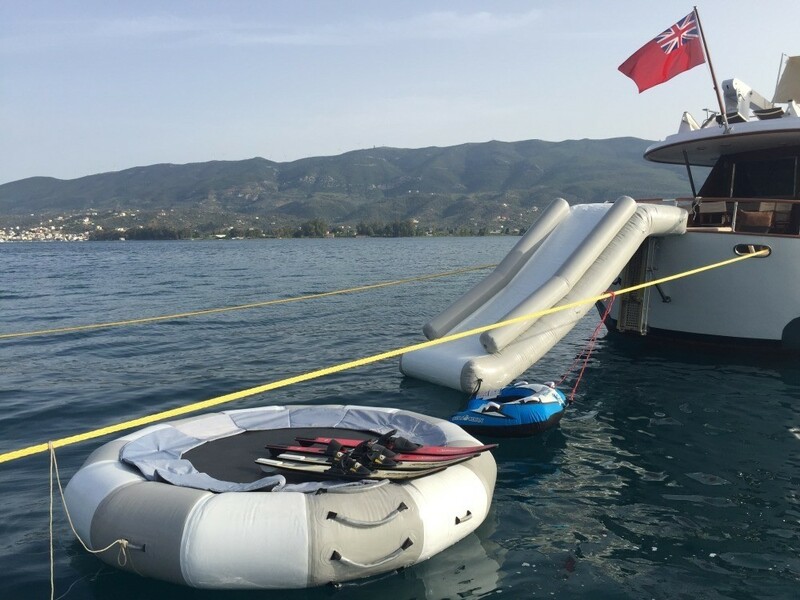 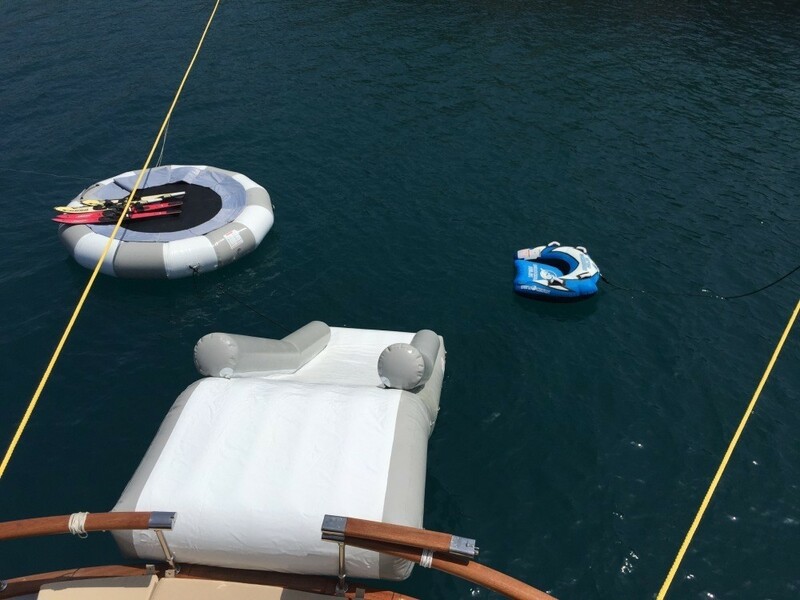 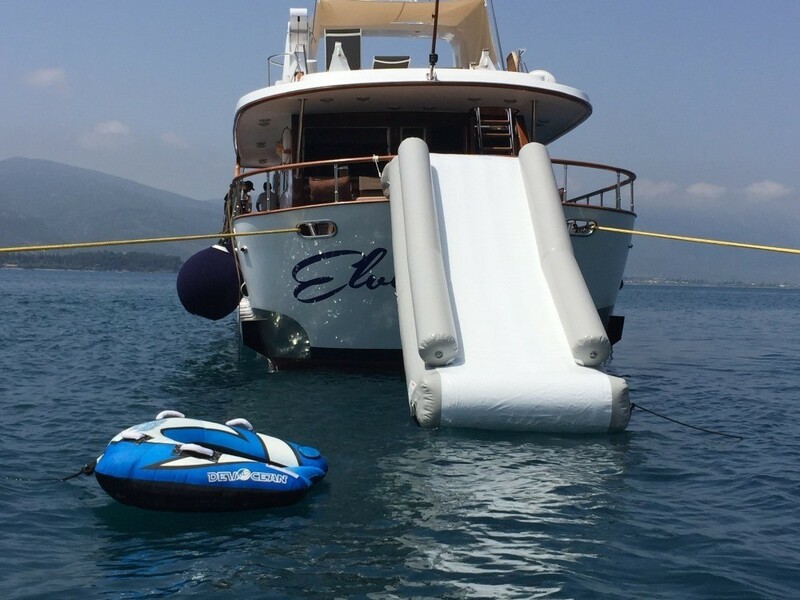 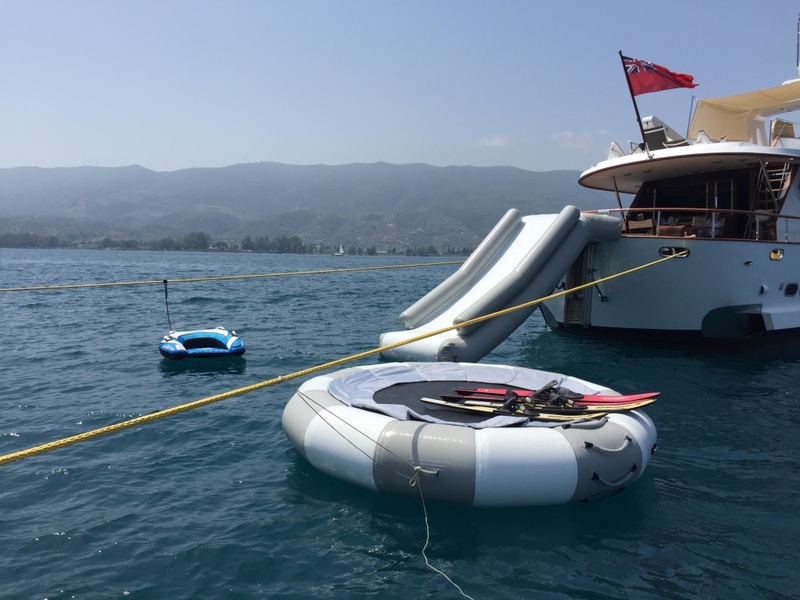 There is a good assortment of water toys available to keep everyone entertained, all easily accessed from the starboard side steps and swim platform. 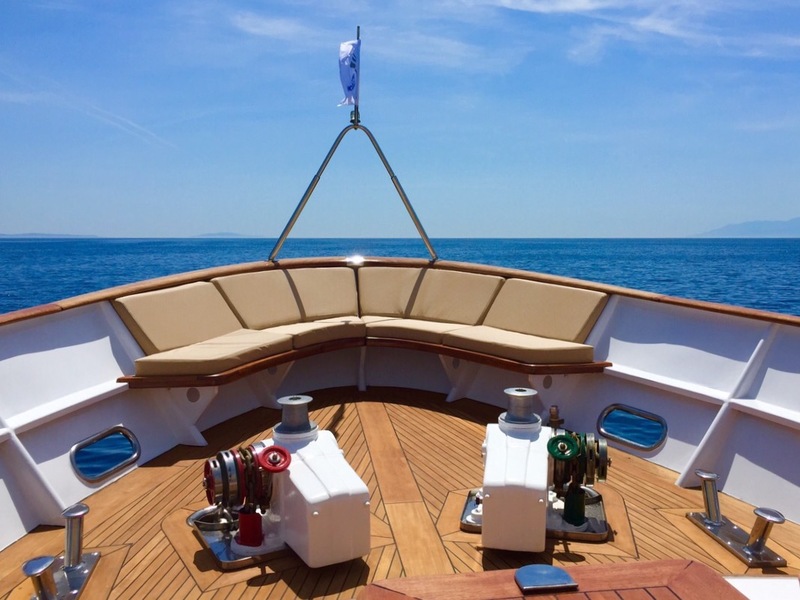 Powered by 2 x 640hp engines, motor yacht OCEANE II cruises at 11 – 13 knots. 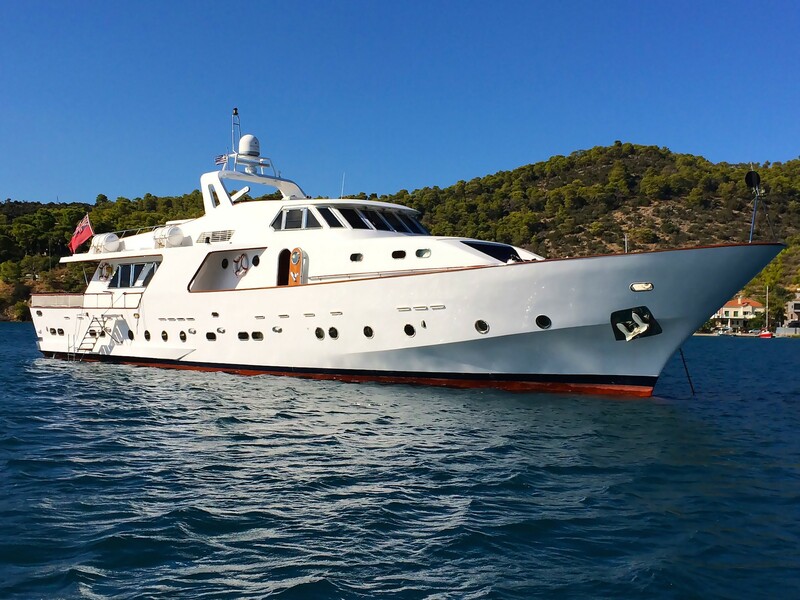 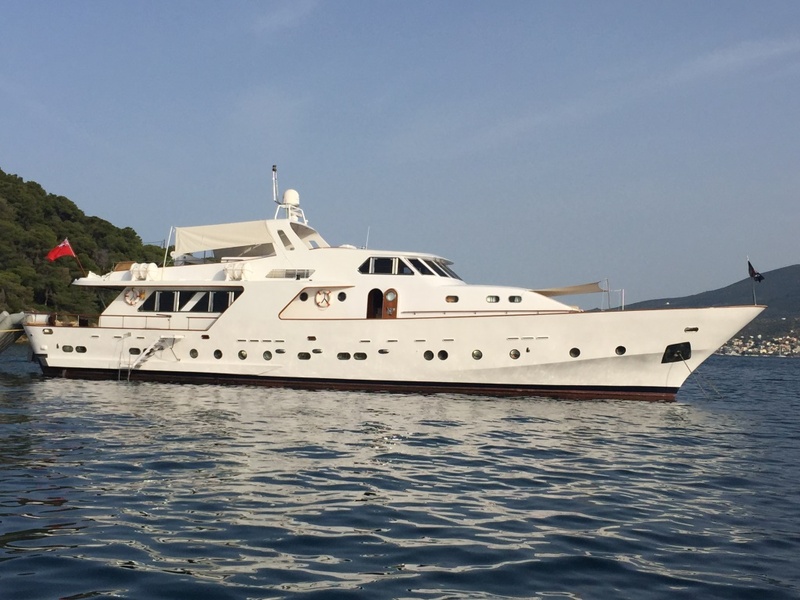 The classic CRN Ancona yacht OCEANE II offers accommodation in 4 cabins, for up to 9 guests. 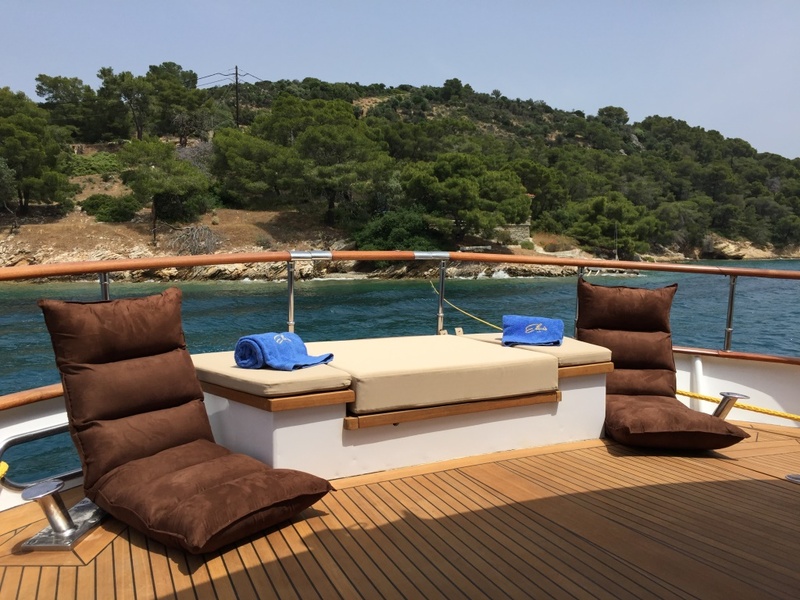 On the main deck forward is the full beam master suite, with double bed and optional sofa bed. 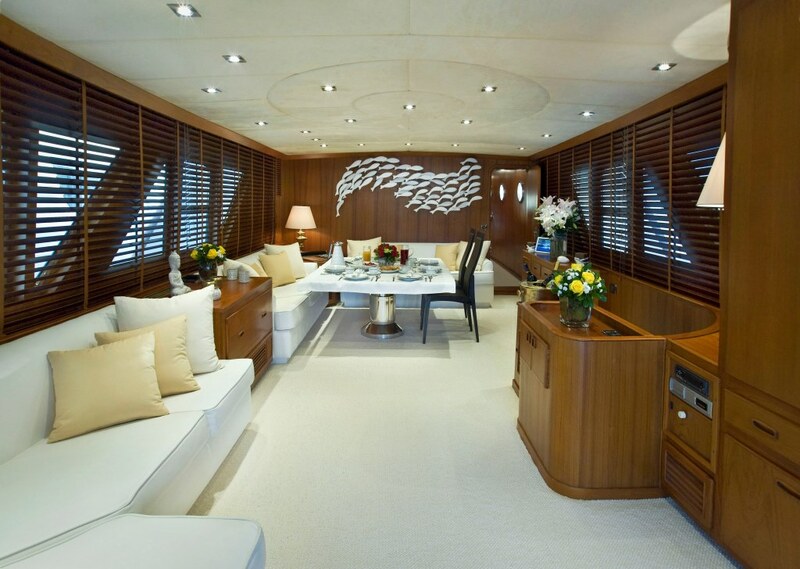 Below decks, the VIP cabin is aft and full beam of the yacht, with a private stairwell from the salon, double bed and small day bed. 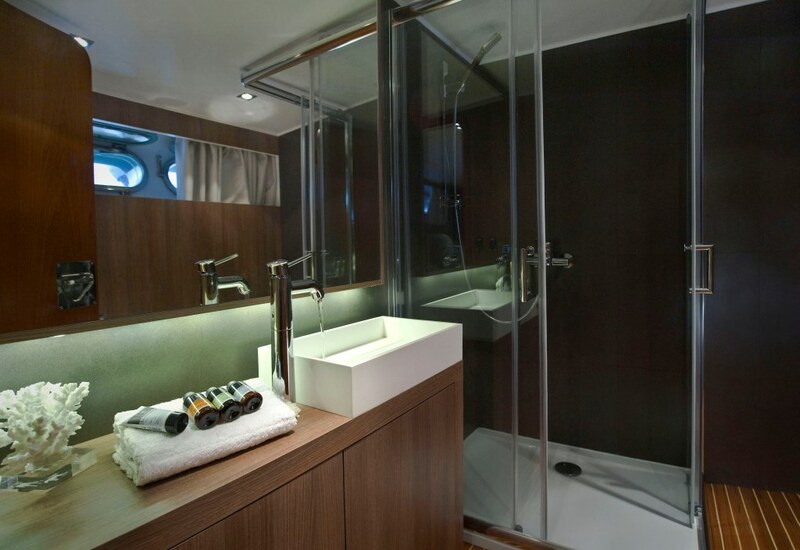 Amidships and accessed from the starboard side foyer, are 2 twin cabins on port and starboard, both with side by side single beds. 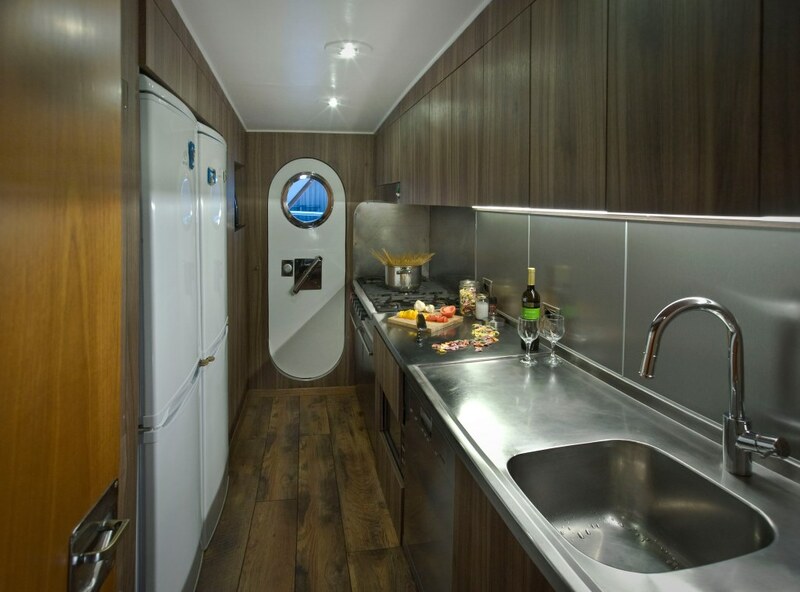 All 4 cabins offer SAT TV entertainment and en-suite facilities. 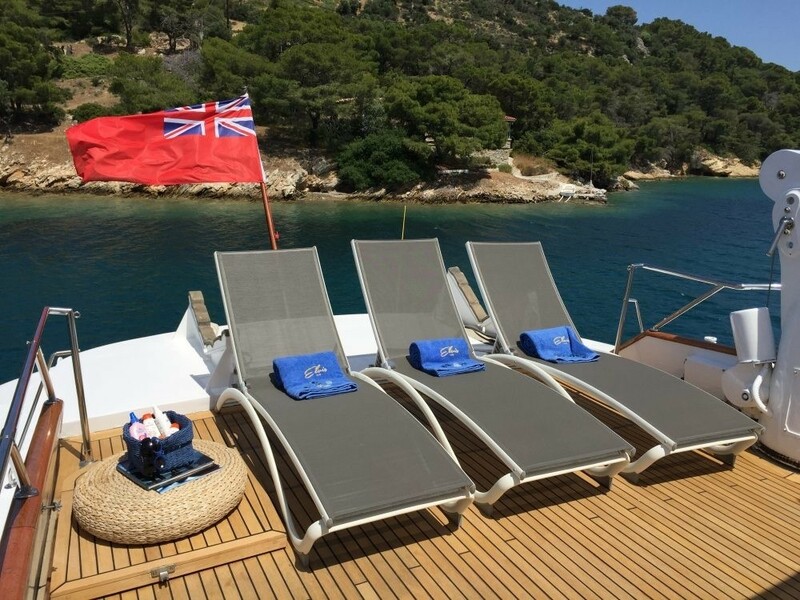 The OCEANE II motor yacht has the following Tenders & Toys: A Tender Novurania 430 with 50 HP YAMAHA outboard, a Kawasaki wave runner (for 2 persons), 2 x water-ski (one set x children & 1 set x adult), 1 water tube, 1 water trampoline, Fishing & snorkeling equipment, Scuba diving equipment (license required). 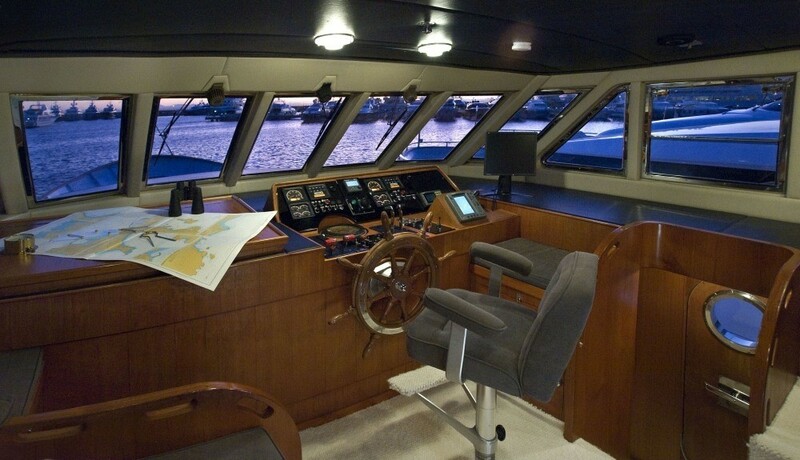 Communications include Wi-Fi connection, VHF, SAT phone. 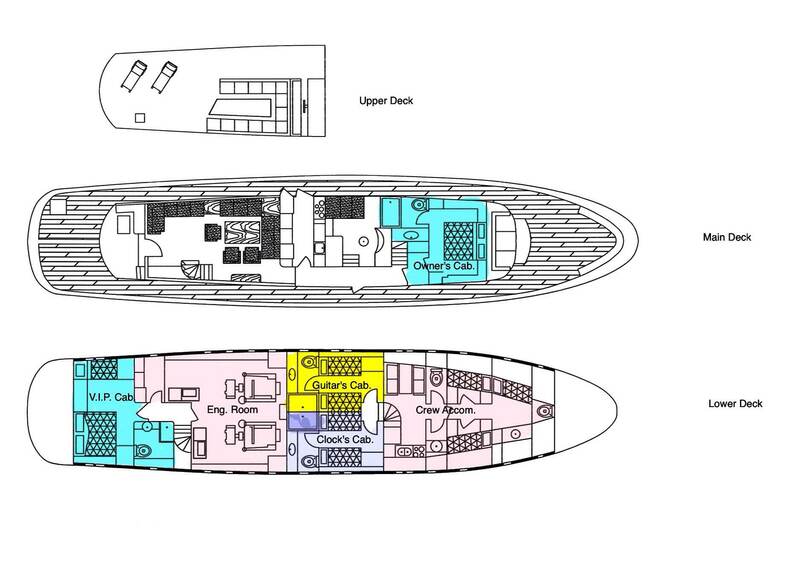 Audio Visual Equipment and Deck Facilities include SAT TV in Saloon & all cabins, DVD in saloon area, Cd players.